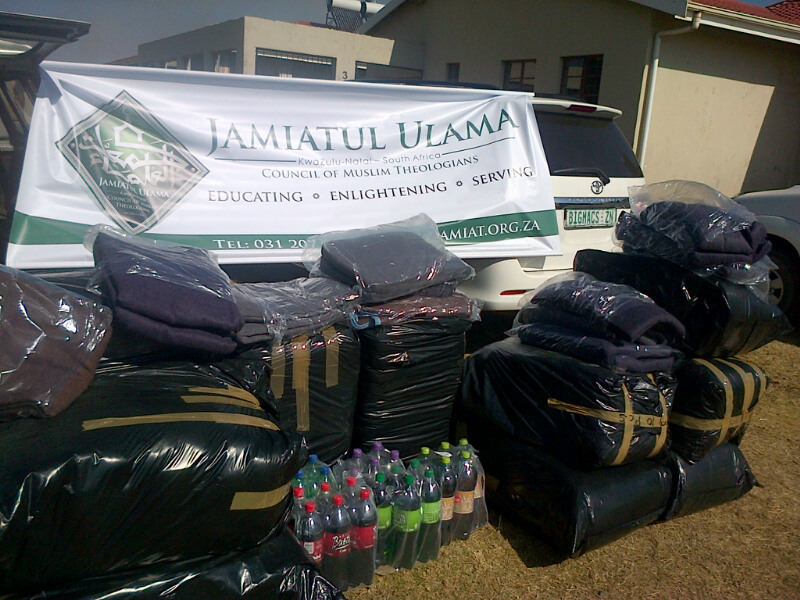 Blanket Distribution – Loskop: The Jamiat responded to an appeal from an Islamic Centre, based en route to Loskop (Estcourt Area), for blankets due to the severity of the cold in that area. 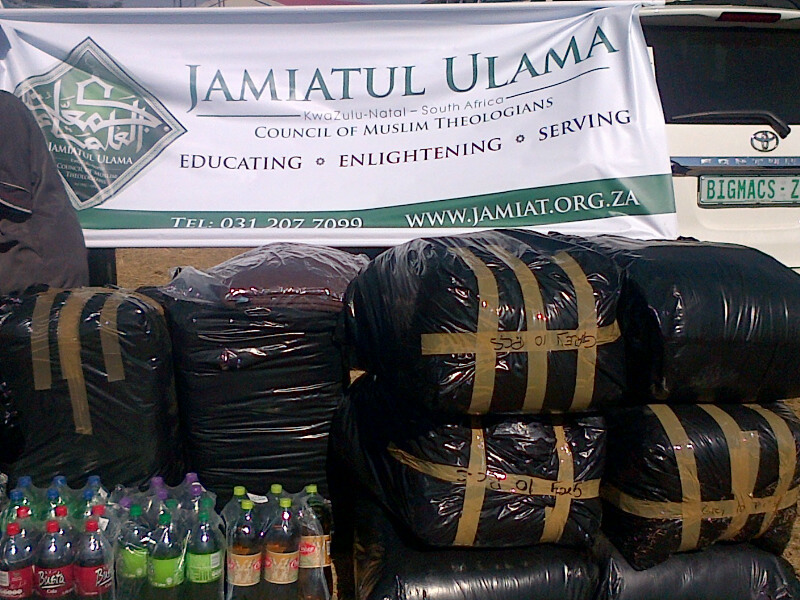 A delegation from the Jamiat offices departed for Loskop on Sunday morning, 14 July 2013 travelling approximately 200km. Upon arrival, we were greeted with a huge, warmAs salaamu alaikum warahmatullahi wabarakatuhu by the 60 odd students, most of whom are orphans, residing on the premises. We distributed blankets not only to the madrasah students but to the locals as well. Aside from blankets; kitaabs, dates and beverages were given to the principal of the madrasah for the students. Upon our departure Ayatul Kursi was recited by the students for our safe return. A second appeal was received by our offices from the Premier of KZN to assist in distributing blankets in rural areas of Pietermaritzburg namely Edendale and Imbali. This distribution was scheduled to take place on Thursday July 18, 2013, Insha’Allah. 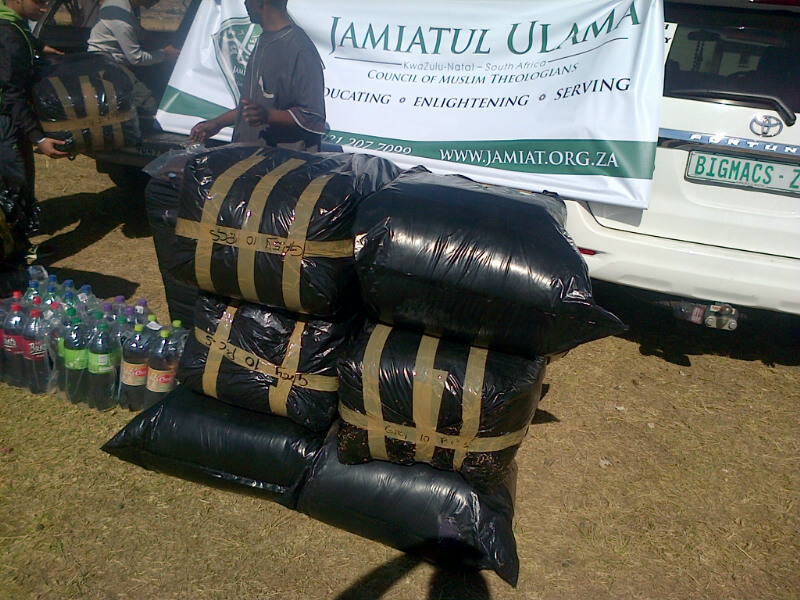 Blanket Distribution (Edendale & Imbali): Following a request for blankets from the office of the premier of KZN, a delegation from the Jamiat offices departed on Thursday morning, July 18, 2013 for Pietermaritzburg at 6am. The team arrived at the ANC Moses Mabhida Branch office in Pietermaritzburg. After a briefing with the ANC Councillor the team together with the ANC members travelled in a convoy to the first distribution site, a day care centre housing 100 children aging from 2 years to 5 years in Edendale. After a tour of the facility, distribution of blankets took place which was well received by the children and teachers. Thereafter the convoy moved on to an old age home named Siyaphilisa Community Based Care in Imbali. This privately owned facility houses approximately 30 terminally ill and homeless elderly people, both local and foreign. These people have been shunned by society due to their sicknesses, the majority of whom are AIDS patients. The eldest patient is 95 years old. This facility is run and maintained by a woman and a few volunteers. This woman was an ANC ward councillor who gave up her position to take care of the elderly who have no place to live. Her constant worry is the availability of food for her patients. After addressing the patients with advice and motivation in the Zulu language, blankets were distributed to them. Together with the blankets, vegetable seeds, garden tools and fertilizer were distributed to both centres to help promote self-sustainability.